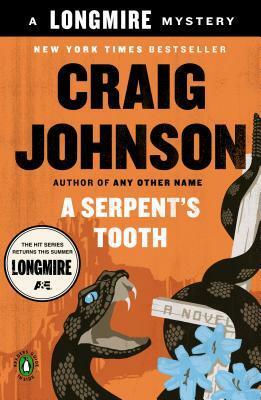 A Serpent's Tooth (Longmire Mysteries #9) by Craig Johnson is available at Amazon, Barnes and Noble, and BooksAMillion. The ninth book of the New York Times bestselling series and basis for LONGMIRE, the hit drama series now on Netflix. This has been one of my favorite books in the series. I love how this series draws out personal relationships between characters through several books, with romance making only brief appearances in each book. This series, taken as a whole, is a superb example of how romances should be done. No over-kill, no pointless eye-gazing; passages pertaining to romance are brief and to the point. And the end of this book, wow! I wasn't expecting a particular relationship to take the turn that it did. I didn't see it coming and oh, how it made my heart hurt. The last book introduced Ms. Lolo Long, a tribal police chief for the Cheyenne nation, and I mistakenly expected more of her in this book, but her name only comes up in a single conversation between Vic and Walt. I'm still interested in seeing how well the Lady Asskickers (Vic and Lolo) get along but I have the feeling that Johnson will draw this story-line out just like he does with the romances: the personal relationships are background material when Walt is on a case. And this case is complex, with the oil industry, South-American gangs, the CIA, and polygamy groups mucking up Walt's attempts to locate the mother of a "lost boy" who winds up in his care. It takes the whole force, all of Walt's resources, to bring the criminals to justice. Longmire the show is true to the books in the same way that Midsomer Murders is true to Caroline Graham's books: the show captures the essence of the characters but takes liberties with plots, which keeps both formats fresh for viewers. The deviations between Longmire the show and Longmire the book-series continue to grow with each book; the gap between the two is now of Grand Canyon proportions.